Home Featured World Of Books Targets Mileage, Time And Cost Savings With Paragon’s Multi-Drop Routing Software. World of Books, the UK’s largest used book retailer, is using Paragon’s routing software to support its rapidly expanding business, while minimising the operational impact it has on the environment. As a result of adopting the solution at the end of last year, the company has already experienced dramatic efficiency improvements, saving more than 27,000 transport miles year-on-year during January while collecting an average of 480 tonnes of books each week. To evaluate the benefits of Paragon’s multi-drop routing software, World of Books initially undertook a trial at its Goring-by-Sea processing hub, before rolling out the system across its entire transport operation. Following the implementation, the company has been able to consolidate its day-to-day transport planning process, moving from a local resource at each warehouse location to a single team at its central transport office. World of Books operates a core fleet of 70 vans and drivers covering up to 80 routes each week, which is then supplemented with short-term rentals and agency drivers during peak periods. The company typically experiences spikes in demand over bank holidays and school holidays, with the fleet increasing in size by as much as 50 per cent. Each charity shop is assigned a fixed day of the week for collection and contacted 24 hours before to confirm it is required and the volume of books to be collected. The Paragon multi-drop routing software factors in vehicle payloads as well as any access restrictions at each location to create the most efficient routes. 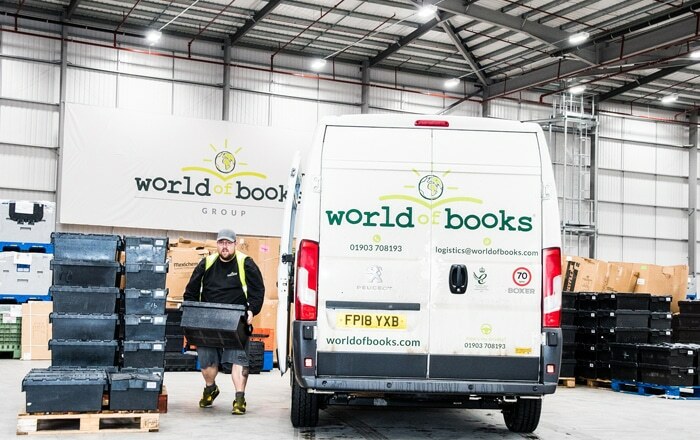 As part of its pledge to travel one million less collection miles by 2020, World of Books is looking to extend its depot network with the addition of more local collection hubs to reduce mileage further. During the evaluation phase, World of Books was able to use Fastnet, Paragon’s distribution network modelling software module, to validate the shortlist of options and ensure any future investment will maximise time, mileage and cost savings. “The Paragon routing software has enabled us to adapt our approach to transport planning. We had previously focused on filling each vehicle in the smallest geographic space – assuming this would create the most efficient plans – but we now understand that routes are best optimised when based on the least time and mileage involved. In just 3 months, this change in approach has allowed us to make real progress towards reducing the carbon emissions from our operation. Opening more local depots will help us build on this success and get a step closer to achieving our ambitious targets,” concluded Murray.